• Danger Mouse a.k.a. Brian Burton − jam session on "I Wanna Talk 2 U"
• Brian Burton a.k.a. 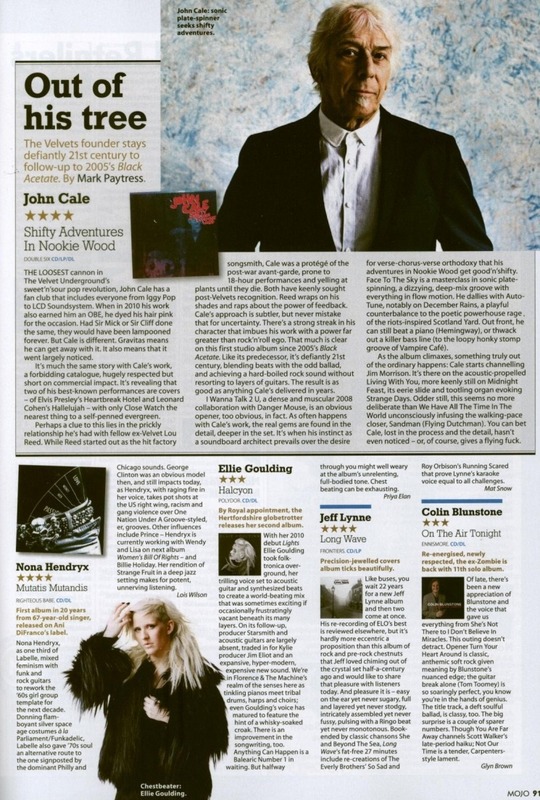 Danger Mouse − producer on "I Wanna Talk 2 U"
∏ It’s with great honour that Double Six announces the release of John Cale’s new album, released on gatefold heavyweight vinyl, CD and digital on October 1st 2012. ∏ Shifty Adventures… is the result of sessions held at Cale’s LA studio. Days were spent experimenting with MPCs, pounding fists onto pianos, manipulating glitches and lots of signature viola drone while patiently waiting for songs to reveal themselves. There was also a spontaneous session with Danger Mouse to create the opening track I Wanna Talk 2 U. ∏ As a producer Cale has reached a new plateau on this record. At the albums most maximal, it feels like looking at a collection of precious stones. Myriads of differently coloured and textured surfaces carefully placed together, each finding their own space to beckon the ear. It’s a blend of chaos and beauty in equal measure and a testament to the exploratory spirit at work, which ensures there’s always something new to the ears on a John Cale record. Website: http://john-cale.com/ // MySpace: http://www.myspace.com/johncaleofficialsite#! ∏ It would be unforgivably patronising to say that a lifelong avant-gardiste such as Cale is "experimenting" by incorporating into his work the relatively commonplace studio tricks of modern pop. ∏ Always the most avant-garde member of the Velvet Underground, John Cale's first new album since 2005 features pianos being hit by fists, screaming synthesisers and violas, insistent beats and Chic-style funk guitar motifs. There are nods to David Byrne and Wire's late-80s blend of instruments and technology, but much of it sounds like pop music made by or for Daleks. For all the sonic wizardry, the album's strongest suits are often the most traditional. The Welshman's rich baritone has rarely sounded as commanding, and his songwriting is sharp. Indeed, Scotland Yard – an intriguing discourse on Leveson and last year's riots ("Who's been breaking windows? Generally misunderstood. You knew it could happen") – is his catchiest pop song in years. Elsewhere, he collaborates with Danger Mouse on I Wanna Talk 2 U, has a back-of-the-bike-sheds reminisce on Nookie Wood, and gets dreamily sentimental on Mary, the domesticity ode Living With You and the beautiful, Eno-like Sandman. The Auto-Tune on December Rains doesn't become him, but it's an album that combines the 70-year-old's experience with the glee of a small child. ∏ In 1968, John Cale married fashion designer Betsey Johnson. The couple divorced less than a year later. ∏ In 1971, Cale met Cynthia "Cindy" Wells, better known as Miss Cindy of The GTOs. They wed soon afterward. Their marriage was rocky, and they divorced in 1975. On 6 October 1981, Cale married his third wife, Risé Irushalmi. They had one child together, Eden Myfanwy Cale, born 14 July 1985. They divorced in 1997. ∏ John Cale currently resides in Los Angeles. © "because you've got the style it takes."